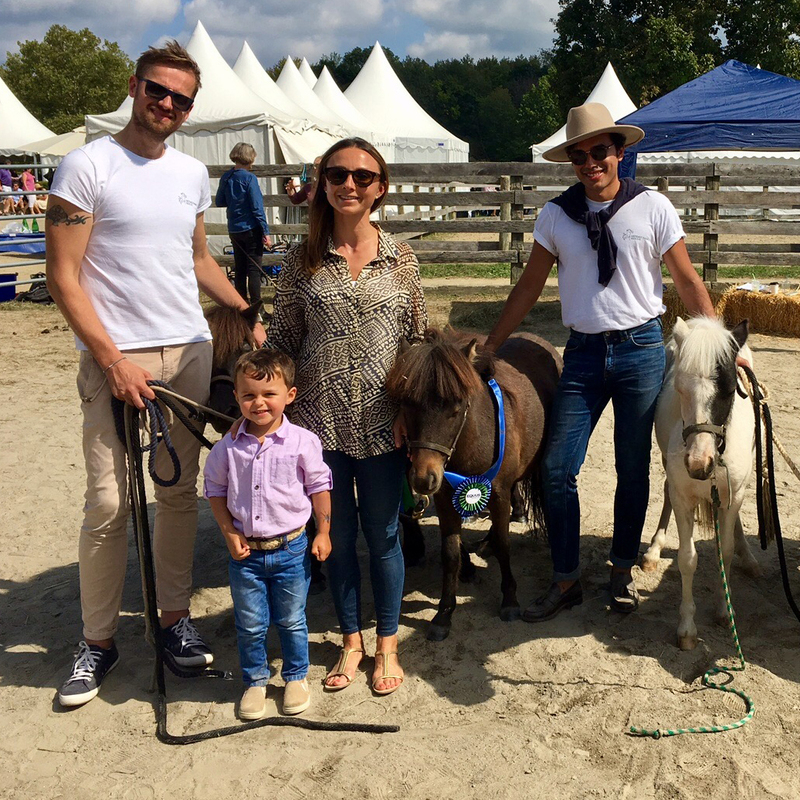 We are proud to be an EQUUS Foundation 2018 Guardian and share our horse care & use practices with the public. 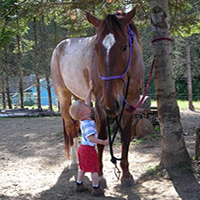 Project Horse connects people in need of renewed hope and confidence with rehabilitated rescue horses, through innovative experiential learning, wellness and therapy programs. 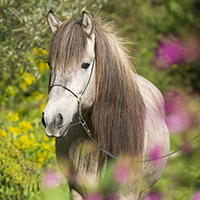 The calming presence of horses, with their keen ability to sense and respond to the human condition, provides an ideal environment for healing and self-discovery. Project Horse is dedicated to improving the quality of life for both horses and humans, creating a unique community of mutual healing and benefit. 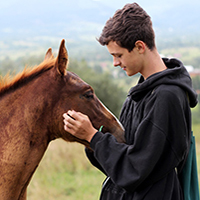 Through therapeutic work with rescued horses, we help emotionally at-risk children, teens and adults in Northern Virginia and beyond to find hope and healing. We specialize in providing alternative therapy services to hard-to-reach clients and to those whom "talk therapy" has proven ineffective. Our horses are integral members of our treatment team, helping facilitate connection and authentic relationship. 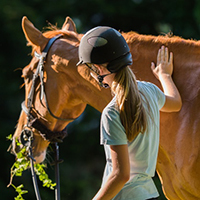 Our goal is to improve the quality of life for both humans and horses, based upon mutual respect and empathy. Through non-riding work with rescued horses, Project Horse provides therapy and wellness services to help individuals cope with mental health challenges and achieve personal development goals. Our wellness services focus on providing clients of all ages a welcome respite from the busy demands of daily life, connecting people with natural world and one another. Project Horse offers serene open spaces, and with the gentle healing spirit of horses, individuals may find inner peace, discover new strengths, build confidence, and find rejuvenation. Our wellness programs include youth day camps, adult retreats, wellness workshops, leadership groups, family-strengthening workshops, and equine field trips. In 2013, Project Horse created a meaningful outreach initiative by launching a very unique local program called the Mobile Minis™. With our miniature horses and gear in tow, we can literally take our mission and services "on the road". We attend a variety of community events with our Mobile Minis™, such as parades and fairs; we educate the public about the power of equine assisted therapy and wellness, and help reduce the stigma surrounding mental health issues; and we enable a variety of groups in the community to have access to our equine assisted programs. The Mobile Minis™ School Enrichment Program is a non-therapy program delivered at various Loudoun County Public Schools. This program enables us to provide services, during school hours, to special education students with a variety of emotional, behavioral, developmental and/or cognitive needs. 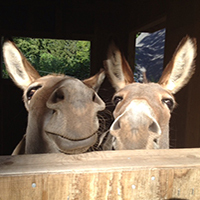 The Mobile Minis™ team is currently made up of three wonderfully unique and large-personality rescue miniature horses: Jack, Penny and Fiona Fudge. Project Horse chooses to not maintain its internal documents or financial information on our public-facing website. However, all information about Project Horse is available to any member of the public, upon request. Our policy is to fulfill requests for information in 2-5 business days, and information is shared online, transmitted electronically, and/or made available via hard copy. *Equine Intake Guidelines and Adoption/Foster Agreements are not relevant documents for Project Horse's operation since Project Horse is not an equine rescue organization. Project Horse is an equine assisted therapy, learning and wellness center only, and we do not experience regular turnover of our herd. Darcy Woessner, Project Horse's volunteer Executive Director, sits on the Board of Directors and is married to Andrew Woessner, the current Chairman of the Board. Maria Kimble, Project Horse's volunteer Director of Equine Wellness, is married to one of our Board Directors, Jeff Kimble. No other directors on the Board nor any other staff members are related to anyone else, in any way. No one, including full-time staff, is compensated. Project Horse does not have a facility that can provide an appropriate foaling or living environment for pregnant mares, or for mares with foals. Additionally, because we are a therapy and learning center with a variety of non-horse savvy clients of all ages, we are unable to house any stallions. Given the unique and low-stress nature of what we do at Project Horse, coupled by zero under saddle demands, we find that horses do not pass a useful period or become unmanageable. If a horse's behavior were to become aggressive, we would consult the vet, seeking an underlying discomfort and potential health problem. We welcome "retired" horses, since they can live out their lives in comfort and contentment at Project Horse, and still have a purpose and something that interests them (our work is emotionally and intellectually engaging for our horses without being physically taxing). With respect to euthanasia of a physically healthy horse that is a danger to himself or others, we would first exhaust other options and work with our veterinarians/trainers before we would consider euthanasia. If euthanasia is the best option, we may opt for a necropsy to see if it was possible to determine if the euthanized horse (that appeared physically healthy) had a brain disease or injury. Given the unique and low-stress nature of what we do at Project Horse, coupled by zero under saddle demands, we find that horses do not pass a useful period or become unmanageable. If a horse's behavior were to become aggressive, we would consult the vet, seeking an underlying discomfort and potential health problem. We welcome "retired" horses, since they can live out their lives in comfort and contentment at Project Horse, and still have a purpose and something that interests them (our work is emotionally and intellectually engaging for our horses without being physically taxing). The only horses that leave our organization would be the few horses that are boarded with Project Horse that are owned by other individuals. These horses seldom leave, but when they have, it's been because the owner has relocated out of the area. We make a lifelong commitment to the horses in our care, and the majority of horses residing with us have been permanently adopted by Project Horse. Project Horse does not own this facility. Project Horse uses only a part of this facility. Project Horse and Trillium Farm, LLC (owned by the Matthews family) have a legal lease contract in place. The contract is for a five (5) year term. The original contract is dated September 1, 2016. The organization and property owners have a mutual understanding that this is a long-term lease arrangement, and each party has every intention of renewing the agreement when it reaches its term expiration. However, if the time comes to terminate the lease arrangement, Project Horse will be granted adequate time to identify and secure another similarly equipped lease property in western Loudoun County. You may contact the property owners to verify this. Project Horse pays the owner a monthly lease fee to have exclusive use of the equine facility, which includes 2 large pastures with run-in sheds, paddock with run-in shed, outdoor riding ring, and large single aisle barn (including stalls and hay loft areas). We have shared use of common areas such as a gathering building (for private and public events) and parking areas. The owner, in exchange for Project Horse's monthly lease payment, handles all maintenance of common areas, buildings and fencing. Project Horse is responsible for all horse care and related expenses, as well as pasture maintenance (self care). Loudoun County Animal Care & Control 39820 Charles Town Pike (Route 9) Waterford, VA 20197 Tel. : 540-882-3211 Email: animals@loudoun.gov Nina Stively is the current Director. ✔ By Appointment Only signs are posted. Additional explanation: On average, we have 20 clients per week come out for unmounted sessions at Project Horse. The actual number varies week to week, depending on the weather and the programs we are currently offering (and whether or not they are for groups or individuals). We do not currently offer mounted programs for clients and therefore we do not have a wait list. Briefly describe the nature/level of the certification: EAGALA provides training and certification for the safe and effective use of horses in therapy and experiential learning. EAGALA focuses on non-riding activities and use of horses only. Additional information about this instructor: This individual is the founder of Project Horse as well as the Executive Director. In addition to extensive horse training, managing and handling experience, she has over 6000 hours of experience as a certified equine specialist, co-facilitating individual and group non-riding programs for Project Horse. This individual has also completed the First Level (Basic Training) of Natural Lifemanship and is enrolled in a training program to become a certified equine professional in Trauma Focused-Equine Assisted Psychotherapy (TF-EAP). Additional information about this instructor: This individual is the Director of Equine Wellness. In addition to extensive horse training, managing and handling experience, she has over 5000 hours of experience as a certified equine specialist, co-facilitating individual and group non-riding programs for Project Horse.